A valid prescription is required to buy Endometrin online. Endometrin is a vaginal insert containing progesterone 100mg. Progesterone is a female hormone important for ovulation and menstruation, it is often used as an IVF drug or as part of an assisted fertility drug program. Progesterone causes changes in the lining of the uterus, making it easier for a fertilized egg to attach to the uterus at the beginning of pregnancy. Endometrin helps the body maintain the pregnancy. Endometrin from IVFPharmacy is sold with a reusable applicator to help insert the suppository correctly and easily. Should you prefer the convenience of disposable applicators for each insert you will need to purchase Endometrin from a pharmacy in the US. This medication is supplied in bottles of 30 or 45 suppositories. Endometrin is supplied in the US in bottles of 21 suppositories. Each suppository is supplied with a disposable applicator. Endometrin is supplied in boxes of 30 or 45 suppositories. One reusable suppository is included in each bottle. 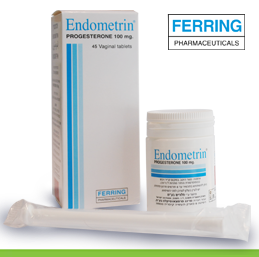 Endometrin progesterone suppositories are used to prepare the lining of the uterus so it can receive a fertilized egg. Progesterone and other hormones help you become pregnant and maintain the pregnancy. This medication is used to increase the level of progesterone in women undergoing fertility treatments because these treatments tend to decrease progesterone levels. Common Endometrin side effects include: Bloating, stomach/abdominal pain, nausea, breast tenderness, headache, drowsiness, mood swings, irritability, or vaginal discomfort. Serious Endometrin side effects that need medical attention: Unusual vaginal bleeding, severe mental/mood changes (e.g. depression), swelling ankles/feet, yellowing eyes/skin, or breast lumps. Urgent medical attention is needed if you start experiencing chest/jaw/left arm pain, weakness on one side of the body, slurred speech, difficulty walking, sudden vision/eye changes (e.g., blurred/double vision, loss of vision, bulging eyes), confusion, sudden severe headache, severe dizziness, fainting, trouble breathing, coughing up blood, pain/redness/swelling/weakness of the arms/legs, calf pain/swelling that is warm to the touch. These side effects are very rare but these symptoms could be caused by a blood clot that can then lead on to a heart attack or stroke, blindness or blood clots in the lungs or legs. My medication shipped right away, and I received it very quickly. There was a problem with the address and IVFPharmacy was able to alert me in time to pick up my medication from USPS before it was returned to sender. This is the second time I have purchased from IVFPharmacy and I would highly recommend them. They have saved me at least $5000. I'm so thankful for IVF Pharmacy. I ordered medication that I could not obtain no where and the medication was necessary for my pregnancy to avoid a miscarriage. IVF Pharmacy respond so quickly and deliver very quickly and always correctly. It's a perfect place to order the necessary medication for the next 3 months following an IVF, or Embryo transfer, or even just to sustain a risky pregnancy. Excellent customer service- Judith was phenomenal with keeping us updated with our delivery when we ran into issues ( all related to USPS, not IVFpharmacy).No issues with customs, delivery was quick in 4-5 days, very competitive prices. Keep in mind that the Endometrin comes with only one reusable applicator. Would use this service again!